The Gold Coast Airport Marathon is held annually in one of the most popular holiday destinations in the world. It is Australia’s premier road race and was the first marathon in the country to hold an International Association of Athletics Federations (IAAF) Road Race Gold Label. The event is held on the first weekend of July and attracts more than 27,000 participants of all ages and abilities across a number of races including the Gold Coast Airport Marathon, Wheelchair Marathon, ASICS Half Marathon, Wheelchair 15km, Southern Cross University 10km Run, The Star Gold Coast 5.7km Challenge and Zespri Junior Dash 4km and 2km races. Spida Everitt v Ben Hannant: Who won the Gold Coast Airport Marathon? THE battle of the Gold Coast radio jocks has delivered a stunning upset for the bookies. Following a week of smack talk on the airwaves, rugby league player-turned-Sea FM announcer Ben Hannant faced off against former AFL star-turned-Gold FM announcer Spida Everitt in the Gold Coast Airport Marathon today. It was billed as the Gold Coast radio version of the Manny Pacquiao v Jeff Horn fight. Everitt was the hot, favorite to beat his cross-town radio rival in the 42km race with sports bet listing Everitt as a $1.50 favorite to win over Hannant who was paying $2.50 to win. But did he prove he was fitter than the former NRL player? Spida — a 43-year-old former St Kilda star, had pledged: ‘My mascara runs faster than Ben’. But it didn’t quite pan out that way. Hannant, a 32-year-old former Maroons prop forward, smoked the former AFL star, finishing the 42km race in 3 hours, 49 minutes and 30 seconds — coming in1,519 out of nearly 6,000 runners. He averaged 5.26 minutes per kilometer. Turns out that proved true. There’s always next time Spida! Everitt, was nearly an hour behind, crossing the line in 4 hours, 36 minutes and 28 seconds. He averaged a pace of 6.33 minutes per kilometer. During a mock press conference on Friday, Hannant trash talked: “I’m a lion, he’s a gazelle, I’m going to eat him up from the start and spit him out half way through’. The Gold Coast Marathon isfamous for its flat, fast and scenic course located alongside the city’s renowned surf beaches and stunning broadwater. The ideal winter running conditions featuring low humidity, little wind and mild temperatures result in 60% of participants achieving personal best times each year. 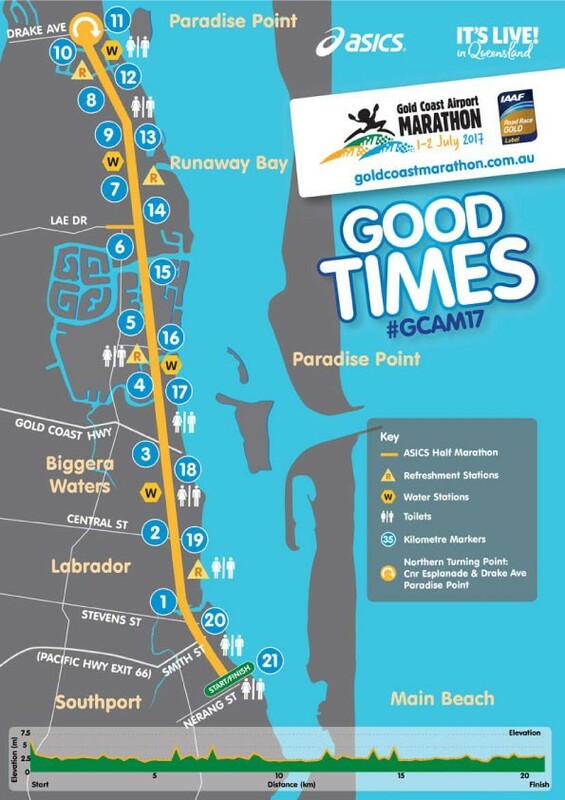 Take time to explore the courses of the 2018 Gold Coast Marathon.